Tunics make for great flattering pieces to have in your wardrobe. They can pair with leggings and jeans effortlessly. This tunic has pockets and comes in a wrinkle-resistant knit … what more could you want from one stylish piece? Will she please make some more tops like these with pockets and different fabrics? The fabric is very good quality, heavier jersey and should last thru many washings. It is super comfortable. I'm at least a 40/42 bust and the large fit me fine. I'm only 5'3" though. I would recommend going with the lower size if in between sizes. I bought this in the polka dot and dark blue print. Wish I had gotten the other one. 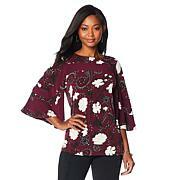 This top is extremely comfortable and washes and dries like a dream. I purchased the black in my regular size and it looks like an expensive top, but it wasn't expensive. I LOVE YOU NINA LEONARD AND ALL YOUR CLOTHES YOU'VE BROUGHT TO HSN. Thank you for bringing quality clothes at affordable prices!!!!!!!! I will be buying more. Soft, washes well, and fits perfectly!! Wish it came in all different colors. My husband actually said "I really like that top!" I bought the black floral. He NEVER says anything about what I wear! Super comfortable, love the fabric and the pockets (which you can't see until you stick your hand in). Please come back with more colors. Solids and smaller florals. Nice material. I like the length to wear with leggings or skinny jeans. Pockets are a plus. Not boxy at all. Would like more prints, but would only buy at the clearance price.